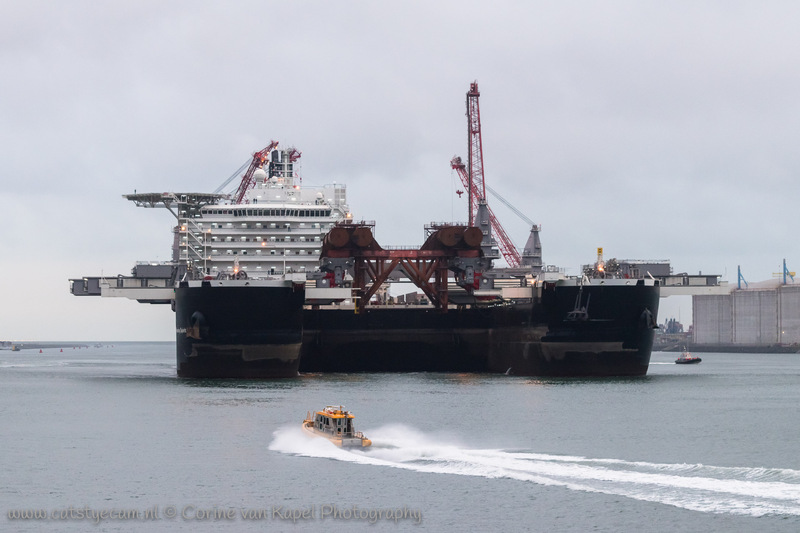 In the early morning of August 6th 2016 the largest vessel in the world, the Pioneering Spirit, left the harbor of Rotterdam. Enough reason for me to get up at 3 o’clock to be able to see it leave. During the last one and a half year the building of the ship was finished in the Prinses Alexiaharbour on the Second Maasvlakte. De offshore-colossus of Alsems left the harbor for the last tests at sea and after that the first work. The Pioneering Spirit is no less than 382 meters long and 124 meters wide, or an area of 8 soccer fields. The ship can be used to dismantle drilling platforms and to place pipelines. The impressive cranes can lift 48.000 tons. To keep the giant operational 24 hours a day, almost 600 crew members are necessary. The costs of building the ship were 2.6 billion euro. At its departure around 6 o’clock many people were watching at the various quays. On the water, a tourist vessel with 450 interested people on board, accompanied the enormous vessel to the sea. And I was one of them!